The table below presents views of Izapan stelae and ceramics. 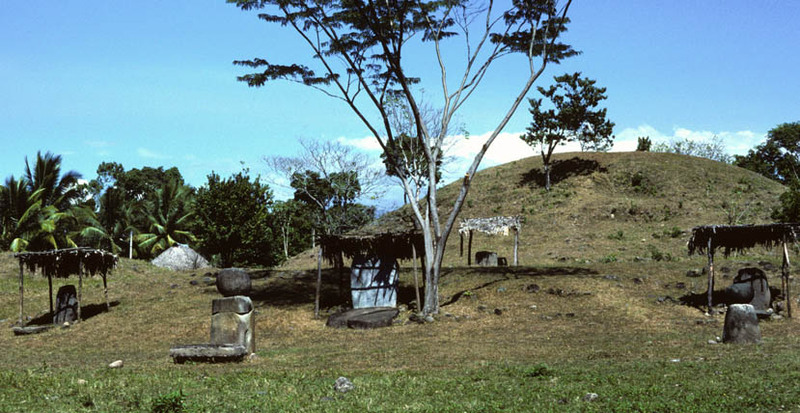 Izapa, an ancient mound/stelae complex in Mesoamerica, is located on the Pacific Coast piedmont along the Mexico-Guatemala border next to the International Bridge a few miles from Tapachula. The Izapa mound complex has the greatest number of pre-Mayan stelae. Each thumbnail photo is a link to a larger version of the same photograph. 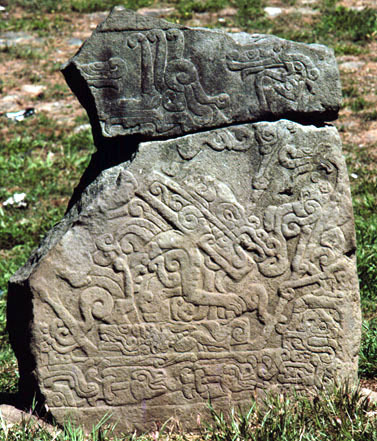 Stela at the Izapa ruins. The site features more than 60 stone monuments. 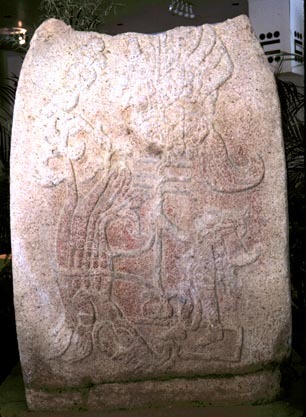 Izapan stela found in the Tuxtla Gutierrez Museum. 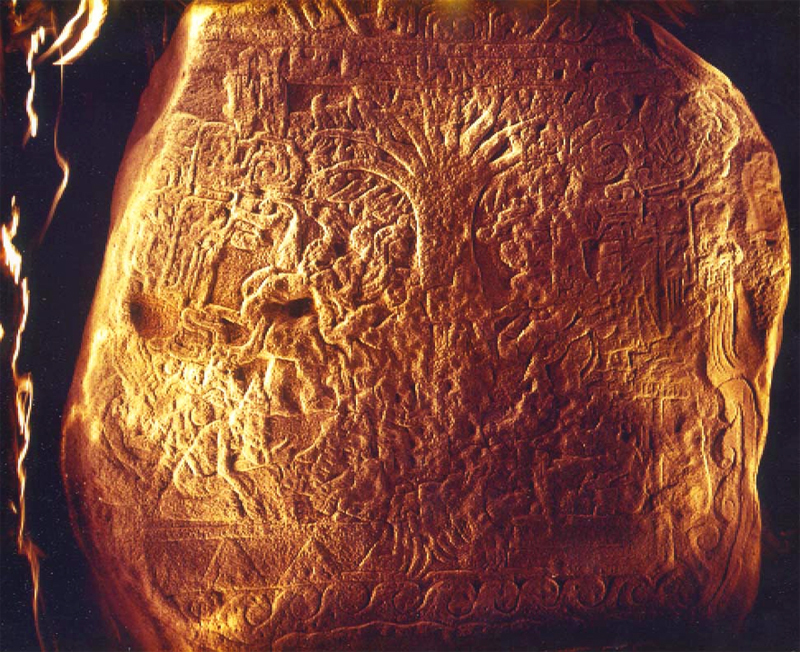 This stela features a human figure facing a possible Tree of Life figure, a combination saurian base with vegetation at the top. This photo shows the super-narrative stela 5, the most detailed and largest of the relief carved stelae at Izapa. The photograph was taken at night with extreme side lighting, a technique used to reveal details not visible during ordinary illumination. The central theme of this image is the Tree of Life. 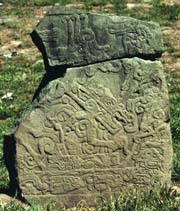 A close-up of details in the lower left corner of Stela 5. The wave curls at the bottom may indicate an ocean. Above this are what may be pyramids. The feet of a saurian, or roots of the Tree of Life, are visible in the upper fight of this image. 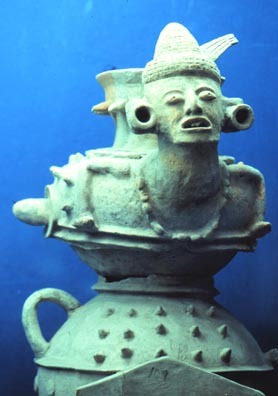 Some of the finest early ceramics in Mesoamerica are from the Pacific piedmont near Izapa. This tradtion continued during Izapan times. The ceramics became more plastic and sculptural as seen here. Like this figure, other figures are goggle-eyed and fanged. 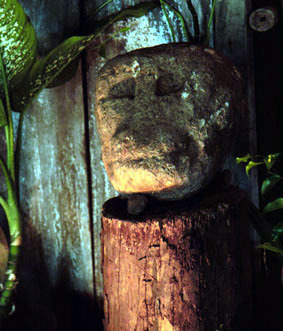 A stone head carving in the Soconusco Museum in Tapachula, Mexico. 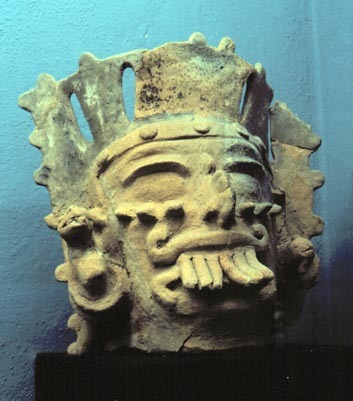 A large ceramic piece found in the Soconusco Museum in Tapachula. Notice the large and distinct earplugs. A variety of earplugs are found on Izapan ceramics, including flowers, animals, and geometric forms. One figure has a snake projecting from one ear plug and a fish from the other. 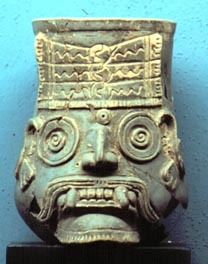 Another Izapan ceramic item from the museum in Tapachula. It was my impression that explicit emotional states are depicted with the plastic clay medium. Some figures have protruding tongues. This figure has interesting curled extensions of the lip lines. 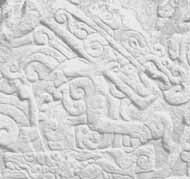 With the many decorated stelae and the decorated ceramics it is evident that the Izapan peoples had a very rich iconography. spherical sculptures atop stelae. Astronomical alignments have been noted for these monuments. © 1999 James Q. Jacobs. All rights reserved.